It is estimated that as much as 30% of our water sources in the United States is used on watering lawns. If you have ever read one of my blogs you know how I feel about sod, I think it should be illegal…but that being said, many people have lawns and we are now struggling to decide whether we keep watering all this grass with an annually shrinking water supply or make a change. We need to make a change. Many of you in areas of Texas and other water challenged states have dead and dying lawns and if you reduce the amount of lawn you have, perhaps just keep the portions that do well and make them purposeful, you will see that they are more attractive and require less work. Hopefully you will eventually become inspired to remove it all in some areas 😉 Having a huge lawn is an antiquated notion and we are the ONLY country who glutinously use our land for grass instead of food. I have listed some quick, relatively inexpensive ways to reduce a large amount of sod while maintaining only a small portion for the least amount of wasted water and maximum effect. Here are some examples. 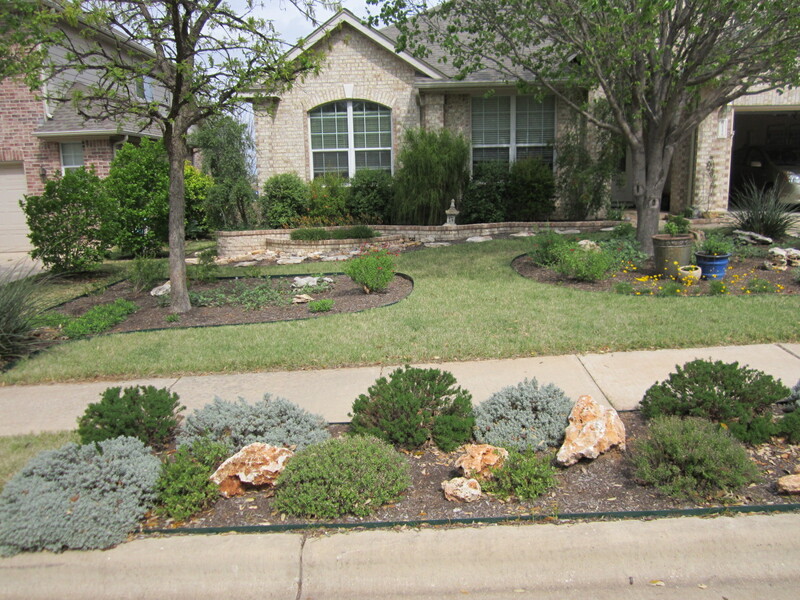 Reduced lawn with Xeriscape beds and river rock nuisance strip. 1) Remove the Nuisance Strip – Removing the nuisance strip (that goofy little space of sod between the street and the sidewalk) and replacing it with crushed granite, pea gravel, river rock or stone reduces a huge amount of sod. That space is the most difficult place to water, (most of which runs down the street anyway) takes endless mowing and edging and rarely looks good due to the extreme heat created by the tomb of concrete it is surrounded by. This is probably the most costly of the 5 suggestions as the grass has to be removed and hauled away. If you are able bodied and have a pick up, you may be able to persuade a few buddies to help out with the incentive of a meal and cold beverage, but if you have it done professionally, it will pay for itself many times over with both the time and water you save. Please consider dumping your organic materials in a “Green” landfill, that way you are not contributing to the growing landfills in America. 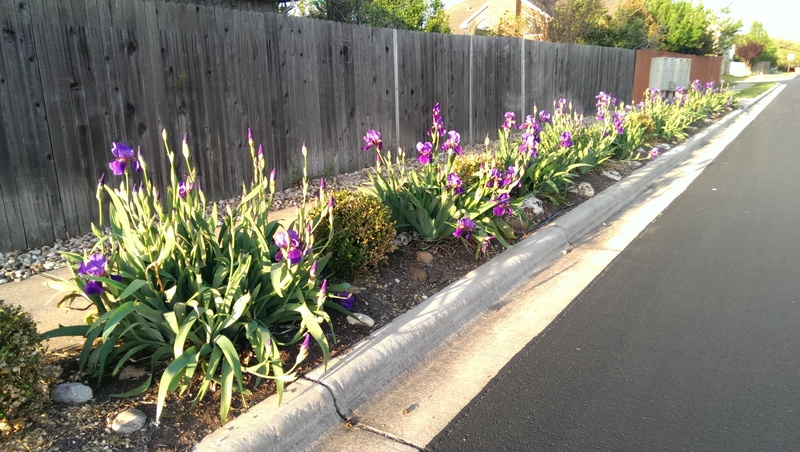 Here is an example of how beautiful a Xeriscaped nuisance strip can look…notice how your eye goes immediately to the yard and the view is not broken up by the weird strip between the sidewalk and street! Here are plants you may not realize are Xerophytic but work beautifully in a low water, high heat situation. This bed has Salvia Greggi, Dwarf Boxwood and Bearded Iris which most people do not realize is an excellent Xeriscape plant for central Texas. This is the best looking, low water, low to no maintenance death strip around! 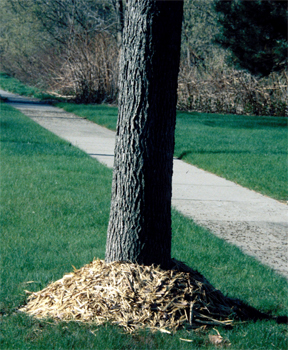 2) Mulch-A great inexpensive way to reduce some of that water hogging sod is to plants shade trees and make larger tree rings on your existing trees. Now it may seem contradictory to suggest you would plant shade trees in the drought, but there are many low water, drought resistant trees that will do very well with minimum care (check them out on Facebook ). Planting a drought resistant tree provides shade for your existing lawn and plants, provides shade to your home, increases your property value and takes up space where water hogging sod used to be. The water you used on the lawn, will now be spent adding a true value to your home. You can even take it up a notch and add fruit trees which provide sustenance as well as shade, Spring flowers and Fall color. On your existing trees make a huge tree ring by removing the grass several feet away from the trunk and replace it with mulch. The example here is a NO NO!!! A muffin can be very filling, but it doesn’t work on a tree…This is how you mulch your tree You expand the mulch bed as far out as you can eating up lawn space and allowing the tree to have a barrier between it and the lawn so it is not competing with the sod for food and water. After all…when is the last time you saw a lawn under a tree in the woods??? You didn’t, you found organic matter that helps keep the tree moist and fed. 3) Add Xeriscape Beds – You can make large mulch beds with native plants, add rock gardens, dry creek beds, patios, decks and water features with recycled glass instead of water. Even a veggie bed will not require more water and time than a lawn and it provides you with delicious organic food. If you are looking for less work than veggies, the stone is the way to go, but here is an example of what Xeriscape can look like!! Here is a quick tour of my space… 4) Rain Barrels – If you have gutters, buy yourself some rain barrels. You can use this water for the small lawn you have left, you can use it for your veggie beds, Xeriscape garden and trees. You can check the facts yourself, but a 2000 sq ft root can collect as many as 30,000 gals a year with an average Central Texas rain fall year. For a few hundred dollars up front , it will save you money over your lifetime. You can google rain barrels for sale and find them online or in your area, or you can go on YouTube and make one yourself for about $40.00…for that much money, you can connect a whole row of them! What was once old, is now new! Whimsy is your ally in the garden. It is your space, the only one who has to like it is YOU! If you are in Austin or the surrounding area and would like information on a low water landscape design or educational landscape consultation please call me at 512-733-7777 or email me at lisalapaso@gmail.com. All of my back yard grass died lin the inferno of this past summer, so I am looking for back yard ideas and also other ideas for how to reduce grass/sod. Thank you for the very informative and timely post on the subject! Thankfully I live in a part of the country that gets pretty good rainfall. We also live in the country. We never water our lawn. Whatever rain we get – we get. I really like the rainbarrel idea tho’ and will try to put it to use this summer. My husband has horses and he runs the rain off the barn roof right into the horse tank. So we are working at saving water. Once you have rain barrels you will be addicted, it is shocking how much free water you are able to collect! Reblogged this on Lisa's Landscape & Design.